The dynamic tunnels are point to multipoint, virtually treating the underlying IPv4 network as NBMA. This is because the destination IPv4 address is dynamically discovered from the destination IPv6 address. Thus if a protocol uses the destination of multicast address, they will get mapped to an IPv4 address which cannot be routed, there by dropped. Because of this reason we have to trick the protocol to use unicast IPv6 destination addresses. The implementation of this depends on the routing protocol itself. 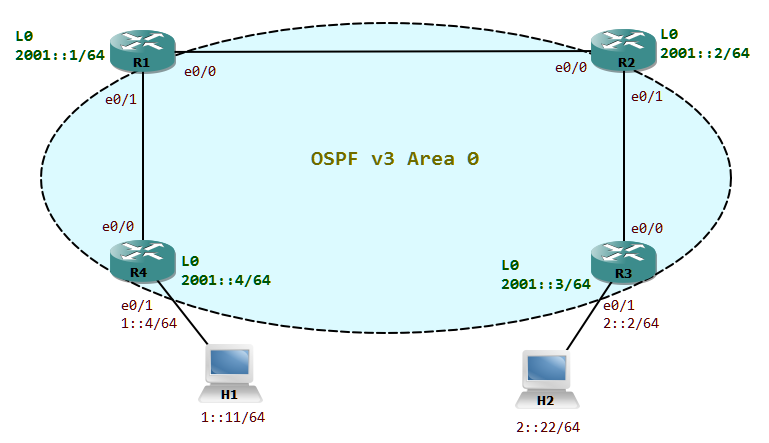 In this blog I will be demonstrating using OSPFv3 over different tunnel types. Automatic 6to4 tunneling towards R1. ISATAP tunneling towards R3, where it acts as a client. ISATAP tunneling towards R4 where both R2 and R4 are servers. Caveats: The most important point to take into account is the IPv6 address itself. The transport IPv6 destination address will be automatically discovered with help of the IPv6 destination address. So we must make take care that the IPv6 destination could be properly mapped to the IPv4 destination. The automatic tunneling mechanisms like Automatic 6to4 tunnels and ISATAP (Intra Site Automatic Tunnel Addressing Protocol) tunnels are point to multipoint tunnels. The destination IPv4 address is encoded in the IPv6 address itself. These tunneling mechanisms treat the underlying IPv4 network as an NBMA network. As the destination IPv4 address is found out from the IPv6 address itself, care must be taken when deploying dynamic routing protocols over these tunnels. Care must be taken that the intermediate routers on the path does know the route to the encoded IPv4 address in the IPv6 packet. R4 advertises loopback 0 into RIP, which is further redistributed by R2 into OSPF. 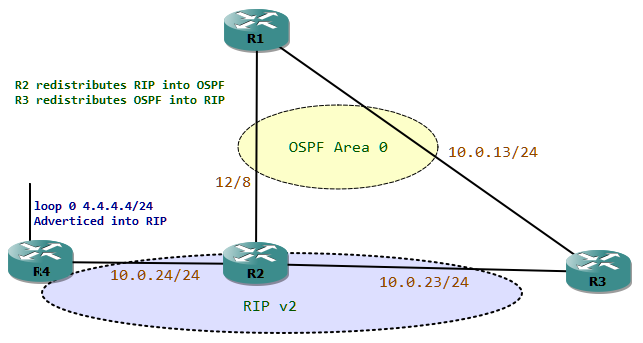 R3 then redistributes OSPF back to RIP with a metric of 1 which causes 2 problems. First problem is that R2 has 2 paths to reach the loopback of R4 one from R4 itself and other being redistributed by R3. Second problem is that link between R1 and R2 will not be advertised to R4 because of the distance vector problem (a router will only advertise a route if it has the protocol activated on the link or if it learns the route from a remote source via the same routing protocol). An IPv6 router does not need a global IP address on its interface like an IPv4 router because it only uses the link local address (LLA) for the convergence of the routing domain. In IPv6 an interface always has a LLA as soon as the interface is enabled for IPv6. The LLA as the name states is not routed across the local link (Broadcast Domain). Routing protocols either of link state nature or distance vector nature exchange updates with their corresponding LLA as source. The core routers R1 and R2 only have a single global address assigned so that they could be accessed from outside their broadcast domain. This loopback address must also be advertised into the IGP which in our case is OSPF. The global address is also needed on the core routes so that they could send ICMP control messages like packet too big, network unreachable, TTL exceeded etc. to the requester. 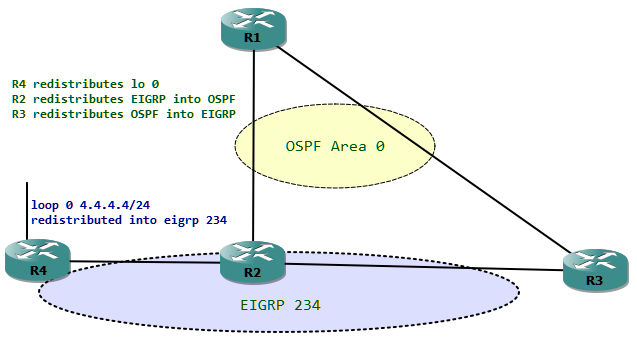 The non-core routers R4 and R3 do have also global address assigned from their respective broadcast domains to the appropriate interfaces, so that the prefix could be advertised via OSPF for the network reachability.